Makalu Barun National Park and Conservation Area is blessed with an incredible diversity of natural beauty and culture. Due to its isolation and lack of tea houses this area still receives few trekkers. Sherpa, Rai and Limbus are the main habitants of the region. You are walking north of the Arun river to Sedua and Nun, then crossing Barun La (4110m) into the upper Barun Khola valley for a close look at Makalu (8463m). The second part of the trek is very difficult and almost impossible without previous experience. The trek takes us deep into the eastern Himalayas, providing some Nepal’s most unseen and amazing scenery. The rare mountain views including Kangshung face of Everest, Lhotse is impressive and aesthetically stunning, offers an amalgamation of cultural heritage, unsurpassed beauty and a great diversity of flora and fauna. The trail takes you from the steamy lowlands of tumlingtar on the Arun river, north into the Sedwa, Num, crossing Shipton La (4127m) into upper Barun Khola valley for a close look at Makalu (8475m) & Chamling (7290m). The trek to Makalu base camp goes through one of the most remote and unfrequented areas of Nepal. The Barun Valley is part of a huge international protected area under an agreement between Nepal and China. 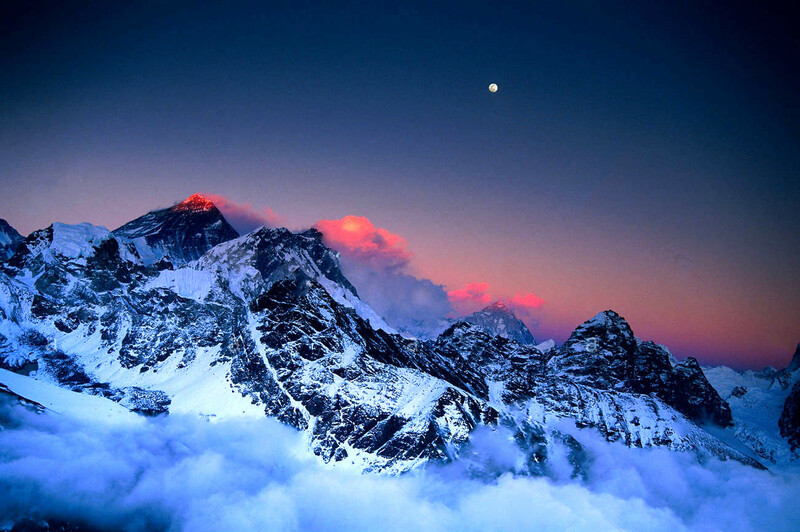 The Makalu Barun National Park was established in 1992 as Nepal’s eight national park. The park of 2330 sq.km is bordered by the Arun River in the east and the Sagarmatha National Park in the west. Barun Valley is a sanctuary for a wild animals such as wolves, lynx, fox and the elusive snow leopard. Our descent into the pine and rhododendron forest from the Barun valley takes us past the lower Barun glacier & into the Makalu Basin and to Tumlingtar to catch the flight back to Kathmandu. A 50 minute flight from Kathmandu landing on a bumpy grass airstrip at Tumlingtar. From Tumlingtar, about 3 hours jeep drive on a bumpy road takes to the first camp at Chichila. A moderate paced walk through the picturesque villages and lush mountain forests. A ridge line with great views on both sides and perched on the end in Num. Thunder and lightning make interesting displays in Num evening. A steep descend down through the forests and terraced plots of land takes to Arun Khola. Then flexuous ascends up the other side again. It is quite hot often - the forest on the valley sides offers a bit of shade. Makalu National Park stars and we register our permits. Camping right at the top of the village. Ascend the ridge bounded by the Ipsuwa Khola on the west and Kasuwa Khola to the east. Crossing the hillside through quiet villages and passing by small paddy fields, we reach the village of Tashi Gaon. Trek upwards towards Khogma, which is the last stop before crossing the Shipton La and dropping down into the upper sections of the remote Barun valley. The green forests are replaced by scrub and rhododendron trees that cover the lower reaches of the mountains. The rest and acclimatization day allows our bodies to catch up with us before gaining more height. The following day we take on crossing of the Shipton La. 7/8 hours of climb towards the summit of the Shipton La which takes a few hours to reach. After passing the lake Kalo Pokhari, we cross the pass Keke La at 4152m. There are marvelous views of Chamlang 7319m, peak 6 (6524m) and Peak 7 (6758m). After crossing the Keke La pass, we descend through the beautiful valley Debotay. Climbing high and sleeping low gives the opportunity to acclimatization. 5/6 hrs from Debotoy, the path through Rhododendron forest leads to the Baruni River and the upper reaches of the valley. A pleasant walk, gaining altitude slowly, until we arrive at Yangle Kharka situated at the base of the valley. Today, we trek to Merek. Since we are gaining height beyond 4, 000 meters, be sure to allow your body the necessary time for acclimatization. Trek to Shersong: 6/7 hrs. Now we climb up the valley, through yak postures and boulder fields. On approaching Shersong the view of south east ridge of Mount Makalu appears. Campsite at Shersong. Make sure that you acclimatize well before walking up to Makalu Base Camp. Enjoy the superb views of the Himalayan mountains throughout the day. Return back to Shersong. Descend to the valley and take our last glimpse of Makalu before turning the corner and eventually reaching Yangle Kharka. Trek to Khongma: 6/7 hrs. It is an initial steep climb from Mumbuk through forest of firs and rhododendrons. Cross the Keke La, Shipton La and Ghungru La. Descend to Khogma again. Trek to Tashigaon: 5/6 hrs. Today, we continually descend to Tashigaon. The descent will be a long and steep one. Then we are cutting across the hillside to reach the Sherpa town of Toshi Goon. Trek to Num: 4/5 hrs. We are retracing the same path we came. We exit the Makalu Borun Camp. Descend to Arun Khola and Seduwa again. Then we have another hike through the forest to Num. We follow our footsteps all the way back down to the river. Climb up the opposite side of the valley to Num. Again we retrace our steps to Chichilo. The final return of the trek will be at Tumlingtar, ready for an early departure to Kathmandu the following day. Tims card and national park entry permit. Experienced guide and porter one for two guests. Three meals a day (Breakfast/Lunch/Dinner) and accommodation in local family house/lodge. High quality Italian camping equipment (Ferino, La Sportiva, Salewa). Down sleeping bag, Down jacket air mat on request.